Ages ago I suggested that as times got harder the indulgence that is the UK's 'decarbonisation' policy would run up against its ever more ridiculous costs: GDP trumps GHG was the coinage. And so it comes to pass. The windfarm pro- and anti- camps are getting increasingly noisy, with no end of spurious arguments on both sides: but follow the money, it's the economics that matter. Take away the subsidies and you wouldn't hear a peep from me because I reckon the supposed health and aesthetic and bird-butchery issues would take care of themselves. If the greens fear they may have reached something like their high- water mark, it looks like they've every intention of screaming until they go blue in the face and rolling around on the floor of the supermarket until they get given a bag of crisps. In the past, commenters on the big newspaper websites fell into predictable patterns: CiF article on wind yields 80% pro, 20% anti; and conversely for a DTel piece. I can't claim this is a scientific finding and I don't have the time to confirm it, but I have the distinct impression that things have changed in just the last couple of weeks: now the DTel gets bombarded with pro. This would be all of a piece with the very recent appearance of the seemingly quite well-organised No Dash For Gas. There are other interesting aspects to the public 'debate'. Both the long-time anti-wind DTel and Mail have come down squarely in favour of new nukes and I am guessing this is a signal to Cameron that they don't mind him having that half of his low-carbon strategy (as well as the fact that - follow the money - the big nuke interests are potentially big advertisers). Finally, even the quite delightfully bonkers Dellingpole (who does the anti cause little good by being so wrong on his facts) has swallowed the green line on public opinion. "In a recent poll, the majority of those surveyed said they wanted more wind power", he writes. That's certainly what the greens always claim but all the polls I've read say nothing of the kind. Ear-plugs all round: this is going to get very shrill. I'm interested in real world experiments. The Germans picked a winning technology, did their mercantilist thing and made sure by rigging the domestic market their companies got to become world leaders in the technology so could be ahead of the competition when markets decided to buy the technology in. The Danish did something similar. How are Danish and German wholesale electricity costs compared to our own in the UK? Even if we rig our market to get nuclear investors to build new capacity, what will the comparison be? It'll be more than annoying if Hayes outburst has no effect on coalition policy (as seems likely), but the uncertainty created scares off General Electric and Siemens from building windmill factories in the north of England. ND, you have a touching faith that greenies and other statists are affected by considerations of money. Didn't you know that saving our little children from the horrors of CAGW is worth everything? In any case the taxpayers are a bottomless pit, if only we taxed the rich more, innit? Basically, "wind farms" are a daft idea, but just happen to chime in with "green" ideas as well as giving pots of money to certain commercial interests. I am certainly "green" but not to he point of idiocy. Just wait until the next very long bitterly cold windless blocking high happens and see how much use they are. BE - german electricty costs are insane and tha is why they won't really phase our nuclear. if they do its curtains for them, especially opposite US shale gas powered manufacturing. CU - yes, gulp, I've read similar stories. However I can't find a direct wholesale (factory gate) comparison between windy sunny Germany and the proposed floor price which will underwrite the new British nukes. "..Germans already pay the second highest energy prices in Europe. Next year, a three-person family will likely have to pay up to an additional €175 ($220) to finance the construction of renewable energy infrastructure. " Denmark pay the highest prices. BE - Danish prices paid by customers are at higher end of EU spectrum and German, as CU + 'nobody' said above, #2. (Danish situation unrepresentative anyway because they have access to Norwegian hydro to balance the intermittent wind). ND, thanks, I think what you are saying is that if the UK gov guarantees prices to encourage new capacity, our retail prices are likely to catch up with Germany's to end up at three times the US level. If this is right, I am against new nukes and new wind at that price...! 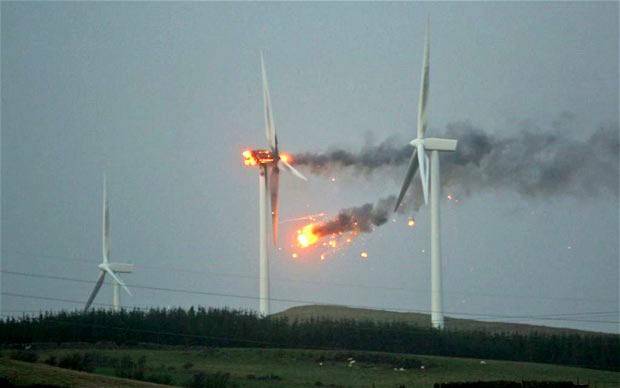 ND, loosing the wind turbine factories would be a great shame, whatever is thought about the economics of current windmills. When it comes to replacing them at EOL (15 years? ), they will very likely be economic without subsidy, when they do not have the initial site and grid costs to cover. So this looks like a quite long lasting industry.